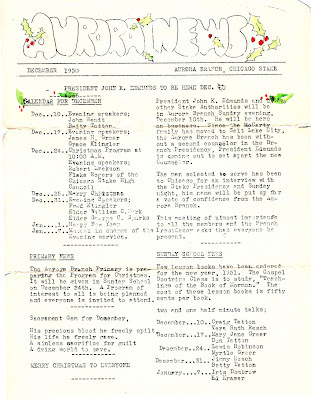 The December 1950 newsletter was a rare, full-color edition. Or perhaps we should say “hand-colored” edition because each page was individually painted by Louise Erekson, who was the newsletter editor, reporter and staff artist rolled into one. Both pages sport her signature holly leaves and berries. 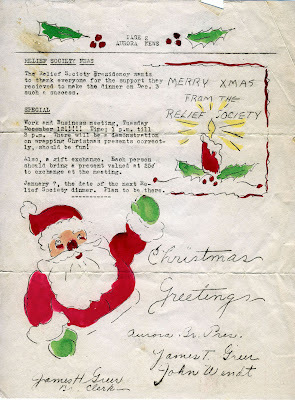 A Christmas candle and Santa appear on page two. The news of the moment was the pending visit of stake president John K. Edmunds who was expected to call a new second counselor in the branch presidency replacing H. Ward McCarty who had moved with his family back to Salt Lake. Brother McCarty was one in a long line of second counselors. Although John Wendt served as first counselor for the entire time that Jim Greer was branch president, it seemed that everyone who was called as second counselor soon moved from the branch. Perhaps thinking he would have someone permanently in place, he called James H. Greer as second counselor. Ten months later, Jimmie left to serve in the Texas-Louisiana Mission. Meanwhile, however, Jimmie did double duty, as he was never released from his calling as branch clerk. In fact, he was not released even when he left for the mission field. His mother filled in for him as clerk while he was gone, and he picked up the reins again when he returned.